Elizabeth Domazet is the owner and director of the Australian Pole Championships, Victorian Pole Championships, NSW Pole Championships, Queensland Pole Championships, ACT & Tasmanian Pole Championships as well as 3 others including South Australian, Western Australia and North NSW that organizers run under the APC banner. 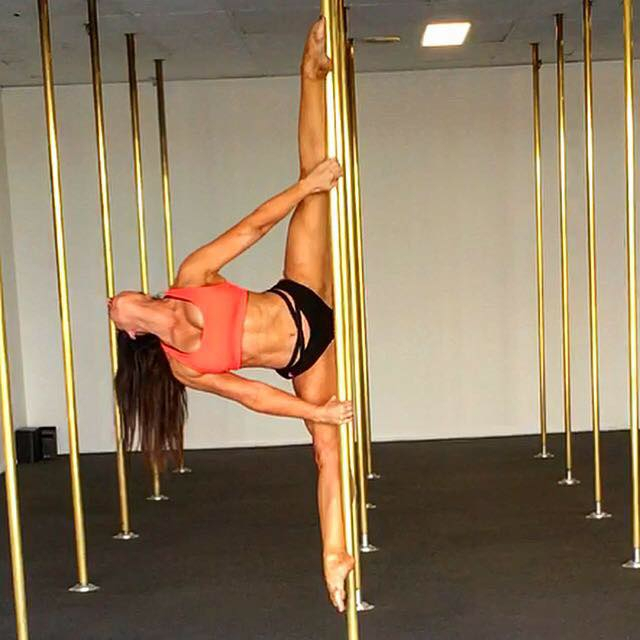 Elizabeth is also the owner and director of the Australian Pole Expo and 2 Aerial Pole Academy studios, and is a renowned national and intentional pole judge and has been since 2011. Elizabeth is a registered and qualified instructor with the International Pole Dance Fitness Association (CEC Fitness Australia approved) . She is an advanced pole dance instructor who has trained with many of the world’s best pole dancers and is an experienced pole dance choreographer whose routines have won her students numerous awards nationally. Elizabeth has also trained and performed with Australian dance companies as a contemporary, jazz, classical and tap dancer, as well as coaching gymnastics and instructing group fitness classes for over 25 years. Elizabeth is the owner/director of the Australian Pole Championships, Australia's largest and most prestigious national pole championships The Australian Pole Championships gives Australian pole dancers the opportunity to compete in a national competition that includes Professional, Amateur, Group and Mens Divisions. Through the Australian Pole Championships Elizabeth introduced four new categories to an Australian pole competition: Best Performer, Best Musical Interpretation, Best Trickster and Best Technique. Elizabeth is also the owner and director of all the state and regional championships that come under the APC banner. Elizabeth is also the owner/director of the Australian Pole Expo which is the biggest pole event in Australia and has participants attending from all around the world. In addition to judging the Australian Pole Championships, Elizabeth is an international pole dance judge, whose experience includes: the 2011 Australian Capital Pole Championships semi-finals, Best Of and Sponsors Awards; the 2012 International Pole Championships (IPC) Choreographer of the Year (Hong Kong), Miss Gold Coast Pole Dance 2012; the 2012 World Pole Sport Championships (London) and Miss SWA Pole Dance 2013 (South West Australia) 2013 International Pole Championships (IPC) Semi Finalists, 2013 Victorian Pole Championships, 2013 Suzie Q's Pole Candy, 2013 South Australian Pole Championships, 2013 Queensland Pole Championships and 2013 International Pole Championships (IPC) Singapore, 2014 APC best of awards, 2014 APC video entries, 2015 APC best of awards, 2014 Pole Candy (Sydney) 2015 APC video entries, 2015 Pole Candy (Sydney) 2016 APC best of awards, 2016 APC video entries, 2016 Miss Pole Dance Queensland (QLD) 2016 Australian Pole Championships Series, 2017 APC video entries, 2017 Australian Pole Championships Series (Arnold's), 2018 Miss Pole Dance ACT, 2018 Australian Pole Championships Series (Arnold's), 2018 APC video entries, 2019 Miss Pole Dance ACT and Elizabeth was invited to judge at World Pole Cup Rio 2012 & 2013, Croatian Pole Championships 2012 & 2013 and the 2013 Korean Pole Championships, 2015, 2016 & 2017 International Pole Show Art Championships. Elizabeth judges over 500 pole routines yearly making her one of the most experienced pole judges in the world.